Today: lamps you threw away, Berke Breathed vs. the horrid Neo-Cons, Entertainment Weekly tells you how to think, the Impeachment brief of 05. Its very late, and I havent edited this at all. Forgive me. Spent part of Fathers Day the usual Sunday way: drowning out the dull roar of existential angst with some shopping. It worked, too. The Mervyns store is closing, so everything is priced TO GO. (As opposed to previous prices, which were set with the specific objective of keeping the merchandise in the store in perpetuity.) I bought a small hand-held vacuum cleaner for those everyday spills  you know, crackers in the seat cushions, great tufts of dog hair blowing back and forth down the hall, and the one substance that defies dustpans and brushes, coffee grounds. I also got some Hello Kitty stuff to dole out to Gnat over the next few weeks and months, and some candles. What the hell. Four bucks for ten tapers. No more saving half-used candles for the next time; were going to live like Rockefellers and have new ones for each candled occasion. Twice a year. It was a fine Fathers Day, but every day is Fathers Day for me. If you want additional thoughts on the matter, hit the BACKFENCE button below, which links to the sap-on-demand column I banged out last week with a pistol to my temple. Got the latest Vermont Country Store catalog the other day. Basic theme: old crap Grandma liked. Reproductions of 1960s nighstand clocks. Underwear that comes up to your sternum and nightgowns that go down to your heels. Horlicks Malted Tablets. Drugstore perfume. You wouldnt be surprised to find radium-soaked shoe inserts. I recognize many of these items from my parents or grandparents house. They have a useless sadness to them; theyve outlived their age, and exist only to bring some comfort to those who regard the modern world with weary disinterest. One page featured the once-ubiquitous Folding Bulova Alarm Clock that needs no batteries, because you have to wind it up, which means it ticks all night long. The loss of the ticking clock is one of the fine achievements of modern life; the tick is an anachronism, a throwback, and perhaps its telling that the only place you ever hear it these days is on 60 Minutes, a show staffed by the CBS news gerontocracy. I barely remember ticking clocks. Early on my parents got an early digital clock, but it wasnt one of those LED numbers: no, the time was told by thin little metal cards on a drum, held in place by a small black clasp. The drum would revolve once a minute. The card would slip from the grasp of the clasp. Click: that was the sound of the minute elapsed. You never noticed it. Unless, of course, you were trying hard to sleep  in which case it was like a rifle shot. No, I grew up with electric clocks, all humming like contended little robots. And even those fell silent eventually. Currently our bedroom clock is a reproduction of the beloved Moonbeam. It looks great, the alarm is powerful enough to wake 14th century Popes, and before the klaxon sounds it flashes lights that hit your optic nerve right through your eyelids. If youre facing the right direction, that is. Anyway. Back to the catalogue. They also sell orphaned candy. They sell Walnettos, which is the reason I get the catalog; as longtime readers remember, Jasperwood was built and occupied for a decade by a nationally famous confectioner who gave the world Walnettos, as well as the unfortunately named Scotch Loaf, which sounds like a Continental euphemism for something you flush. The catalog offers Snaps, a licorice candy I recall with mixed emotions. When pliable, they were exquisite; when hard, they were as savory as anise-flavored raw rigatoni. But the box was made a good kazoo, and you could blow on it until your parent went nuts and snapped. Hence the name, perhaps. This was geek gear in the late 60s. 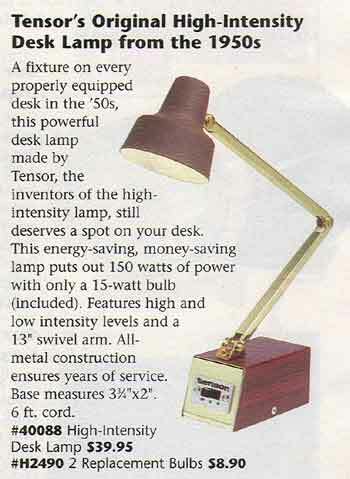 Everyone had a Tensor lamp back then, it seemed. I am hesitant to google it, lest I find there are many online clubs and yahoo groups for Tensor enthusiasts. What happened to Berke Breathed? I enjoyed the first few months of Opus, because he obviously put more time into the strip than the rest of the clock-punchers who do the comics. But the last several strips introduced a new villain: NEO CONS. They live in a castle. Because theyre, like, evil. And they have come up with a candidate to carry out their dark agenda: Bill the Cat. He ran for office to carry out the NEO CON agenda, which was explained in the last strip. Whats our first task, Mr. Vice Mayor? kind gentle decent trusting Opus asks of his NEO CON overlord. Potholes? You know, something that would be good for people. Wal-mart? he says. A reasonable response, since hyper-efficient mass retailers are foul, wicked, predatory, and opposed to NEO CON core values. Teenagers, the NEO CON replies. And the reader thinks: huh? Because thats what the whole NEO CON agenda is about, you know. Insolent youth. I dont know  maybe Breathed is just reaching for the same old handy clichés and slapping NEO on them to make them timely. Im reasonably sure he has no idea about the whole Neo-con / JEW smear. He doesnt strike me as the sort of fellow who follows such arguments in great detail. Next frame: Bill the Cat is standing on boxes of Miller beer; hes wearing an American flag tie; hes saying Ack! Thbbft, and several gross ugly guys are standing around drinking beer saying Ack! Thbbft as well. It was funny when Bill the Cat said Ack! Thbbft 20 years ago. May I suggest it is less funny today? And that Breatheds strip is completely incoherent? Again, its the assumptions: since youre reading a newspaper, surely you regard the NEOCONS as machivellian rogues, as evil incarnate, so youll understand why this is funny. Right? I mean, they believe that we have enemies. Granted, we do, but theyre like so way overboard in believing that our enemies are, like, en-e-mies, as opposed to, you know, enemies. Anyway who cares, theyre bad. And who shows the most contempt for the average guy? Joe Sixpack? Well, Breathed. I can only imagine what I would have thought in 1977 if someone had popped out from the future, handed me a copy of the latest Entertainment Weekly, winked, and vanished. What a future I had ahead of me! Cover story: a new Batman movie. The FOURTH ONE! Other cover stories: Spider-Mans Evil Enemy, Star Wars, Lord of the Rings. I would have flipped it open for details  and Id have been instantly sidetracked by the car ads, the computer ads (wireless notebooks? Huh?) and the tantalizing prospect of movies available on VHS and DVD. Whatever that means. What a future laid ahead. Unlike Moore, Schwartzberg doesnt cram his message down your throat. He just shows the world as we know it, says Rice, whos hoping Disneys outreach to Rotary Clubs will help draw crowds to witness Americas patriotic vignettes, including profiles of a blind mountaineer and a reformed felon. The film is like a patchwork quilt of all the different voices that make up this country. All those, that is, but Moores. Got it? Any movie that contains greeting card views of America had better include Mr. Moore dropping a Scotch Loaf on the land of the free, or its dreadfully inauthentic. The article is headlined Patriot Act. Just so you know to beware. If I sound as though Im hammering small things as if they were nine-part series in the WaPo, I suppose thats because I am doing exactly that. Sometimes I react to the small things with excess zeal because the large things have, over the course of a weekend, driven me daft. Stark raving bezoomy, as Alex would say, my droogs. Sometimes the disconnect between the editorial page and the real world is so vast I wonder whether we can ever agree about anything any more. I mean, Im reading The Connnection by Stephen Hayes, the book that spells out all the information and intel about Saddam and Al-Qaeda. Im old enough to remember when this was conventional wisdom. Why, I even remember back to the end of 2001, when the general mood seemed to favor bold action to forestall future catastrophe. If we hadnt deposed Saddam, and Bush had won a second term, and there had been a terrorist attack in 05, this book would be the Democrats brief for impeachment. BUSH KNEW and did nothing. And its not going to get better. I dont think the next attack will bring us together like 9/11. Last time a small portion of the nation went straight to blaming us for enflaming poor Mo Atta and his motley crew; the last three years have seen that poison spread and flourish, and blaming America for the ravings of medieval theocrats is now a legitimate argument in polite society. Id almost venture to say that a third of the country would conclude that a radiological device exploded in Manhattan would be Bushs fault, because he made the evil doers (roll eyes) super-extra-fancy-grade-AA mad. For the last few weeks Ive had this gnawing belief that bin Laden got lucky by attacking during Bushs term. Conventional wisdom says the opposite, because Bush fought back. But hes the enemy now. I ask my Democrat friends what theyd rather see happen  Bush reelected and bin Laden caught, or Bush defeated and bin Laden still in the wind. Theyre all honest: theyd rather see Bush defeated. (Theyre quick to insist that theyd want Kerry to get bin Laden ASAP. Although the details are sketchy.) Of course this doesn't mean they're unpatriotic, etc., obligatory disclaimers, et cetera. But let's be honest. People are coming up with websites that demonstrate ingenious technology for spraying anti-Bush slogans on the sidewalks; it would be nice if they sprayed "DEFEAT TERRORISM" or "STOP AL QAEDA" now and then. Wouldn't it? Perhaps this is why I havent written much about the subject lately with the usual chest-thumping brio: I think its going to have to get much worse before we get clarity. Most days I just dont know what to say anymore. There are fiends out there chopping off the heads of Americans for their god, and we have cartoonists who think its the height of insight to show the Neocon cabal as port-swilling fat men bothered by baggy pants on insolent teens.